This display is the ideal way to clearly demonstrate the visible advantages Optium Museum Acrylic® provides your customers and the artwork they treasure. Framed Display – 15.0”W X 11.5”H X 2.25”D, Visual aid to explain the importance of UV protection, Sheet explaining how to use display, Micro-fiber cloth to showcase the anti-static feature. Show your customers the clear difference of Optium Museum Acrylic® with this demo that compares the anti-reflective and anti-static features of Optium® versus regular acrylic. The kit includes a side by side specifier comparing Optium Museum Acrylic to regular acrylic. The microfiber cloth can be used to generate static. You will notice how the styrofoam balls will attract to regular acrylic but not to Optium. Also, use the steel wool to test the product’s abrasion resistance. This specifier can be placed over your customer’s artwork to show them how their artwork will look framed with UltraVue® UV70 Glass. This specifier can be placed over your customer’s artwork to show them the different effects of each glass. It provides a comparison between regular clear glass, UltraVue® UV70 Glass, and diffused glass. This specifier can be placed over your customer’s artwork to show them the different effects of each glass. 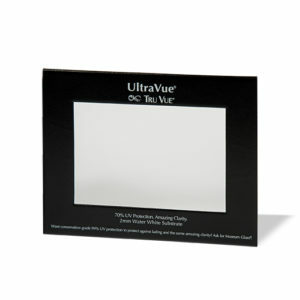 It provides a comparison between regular clear glass, and UltraVue® UV92 Glass.